An ultracool way to stash your picks! Keep your pick close at hand wherever you go with this epic Pickbandz pick-holding bracelet, available in assorted sizes/colors. 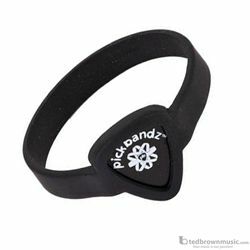 Simply insert your guitar pick into the pliable,100% surgical grade silicone (not latex) wristband and it will stay securely in place until you are ready to rock!